Setting one intention for the year has pretty much removed a boat load of stress. And concern over priorities, making plans, how I should be spending my time… all of it. I’ve simplified my goals (is it me or does that word somehow feel stuck in the 90’s? ), both personally and professionally. 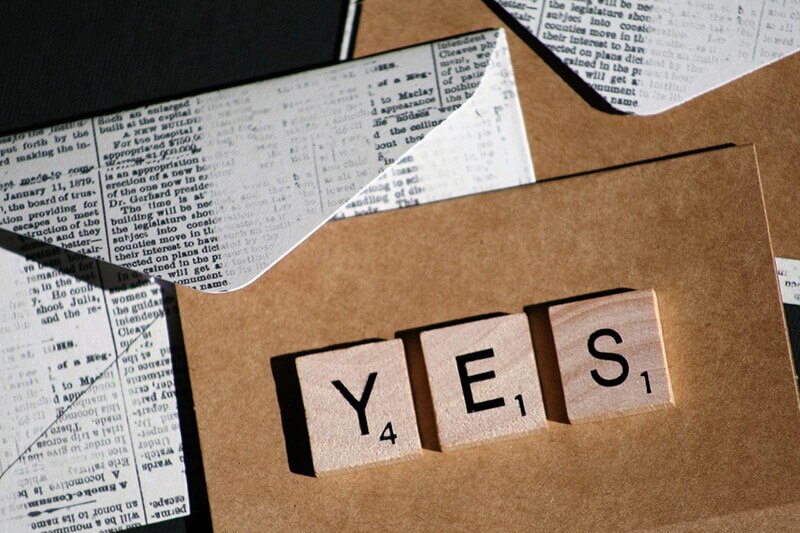 The challenge with simplifying and staying focused is figuring out what to say Yes to and what to say No to. Of course it’s easy to get caught up in your head about missed opportunities and stepping outside of your comfort zone. Shonda Rhimes (creator of Grey’s Anatomy), spent a year saying ‘Yes’ to things. It went so well she even wrote a book about it. At the end of the day if it’s not in alignment with your overall objectives /goals / intentions (whatever you want to call them), does it really serve you? There are a lot of opportunities online to step outside of your comfort zone. There’s also only so much time in the day. It’s a little exhausting if you start listing out all of the different elements that need attention in an online business (content, sales, social media, analytics, email marketing, relationships, lead generation…). So how do you decide what you say Yes to and what you say No to? Consult the Magic 8 Ball? If only that worked (because c’mon… it’s kinda fun). I’ve made it really easy to decide what I say Yes to and what I say No to (keep in mind this is still something I work on… on a daily basis). I sit with it and think about how it makes me feel. If the thought of it gets me excited, it’s a no brainer. Unfortunately not everything is that clear. I’ve made a promise to myself that I’ll at least wait 24 hours before giving my answer (unless it’s that initial gut feeling that gets me excited). Which is why I said Yes to a blog post with iThemes. I’ve done a couple of these posts (a written interview) and have enjoyed each one. iThemes does a great job promoting them, it’s visibility for me and I truly enjoy doing it. Which is why I jumped when they asked me to do a post about email marketing (no surprise there that I responded immediately). These are the opportunities I will continue to say yes to. You can read the article by clicking the link above. And I’d seriously love to hear from you about how you decide what to say Yes to and what to say No to. Great article Kim. Many wise insights. No is a complete dental… That’s another gem! I used to say yes to almost everything. As such I grew from a freelancer to a small agency through the need to service saying yes to everything. Then I realised this totally sucked and was a vicious circle. Say yes to everything, need more team members, need to keep all the team paid, say yes to all opportunities. I can categorically recommend anyone heading in that direction, stop and rethink. The idea of one word per year is great. Nowadays I flat refuse all the crappy jobs… I don’t care what they want to pay, I’ll not do it. I’m still over committed at times, but with much more fulfilling and enjoyable projects. Sorry for the belated reply, not sure how I missed this. I totally agree, “saying no is fun and liberating”… there is a such a freedom in remembering that we get to choose! Oh and when I said dental… That’s supposed to say sentence!